These aren’t ordinary salted peanuts ... they’re plump, meaty, hand-cooked Virginia peanuts with a big reputation and an even bigger crunch! The super-sized, cream-of-the-crop gourmet peanuts are lovingly hand-cooked in golden peanut oil with no additives or preservatives to alter their natural goodness—and you’ll taste the flavorful difference. Loaded with protein, vitamins, fiber and other health perks, they’re gluten-free, Kosher certified, lightly salted and the ultimate gift for any peanut lover! 10.5 oz. 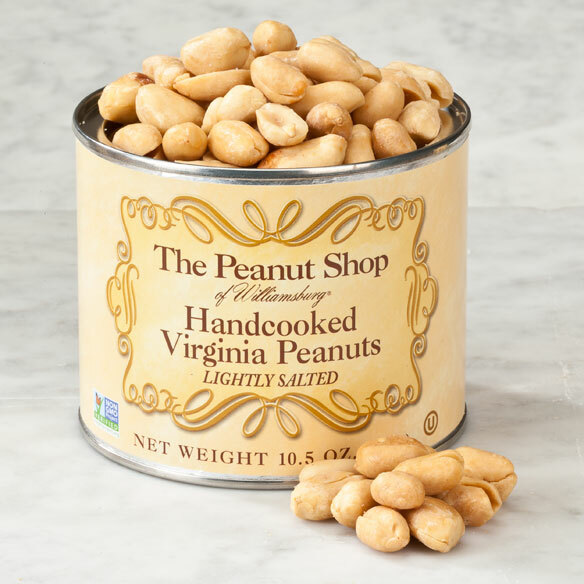 We are a peanut-loving family, and love these Virginia peanuts. Just the right touch of salt. I just loved these peanut's they are so good. I normally eat the hold can. When I am watching tv. Reaching for more.So good so tastie. Keep them coming. I love these peanuts and I have been trying to get them for the past month are so I order them then they are cancel please send them if you have them thank you. I just love these peanuts. I love peanuts hope these are good. Will let you know. Have always wanted to try them. I want to try them. They seem like a great snack. I love your hand salted peanuts. Had them before and they’re the best! They are soft to my teeth and taste so fresh.